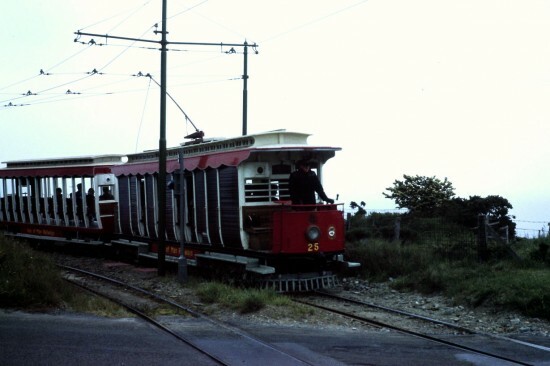 Continuing with the Manx Electric Railway theme for today’s archive image we are again in 1979 for a view of a tram which hasn’t run in passenger service for over 20 years but at this time was a firm part of the operational fleet – it is Paddlebox no. 25. Judging by how the motorman of 25 is dressed it seems to be a bit chilly on the Isle of Man when this photo was taken with the majority of the shutters also down to protect any potential passengers from the weather conditions. 25 is joined by an unidentified trailer as it passes an unidentified location. 25 originally arrived on the Isle of Man in 1898 as a trailer before becoming a motor in 1903 – and it was at this point it received the number 25. At the time of this photo it had just re-received standard fleet livery after a short period in a livery for Queen Elizabeth II’s Silver Jubilee. Withdrawn from passenger service in 1994 it became part of the works fleet until 1996 when it was taken out of use once and for all. An aborted overhaul took place at the turn of the century and 25 is now stored at Laxey Car Sheds sans trucks.